Khushwant Singh may his soul rest in peace. In the time which has elapsed his soul must have found a body. We will know when the writer in the person starts to erupt out of its being. 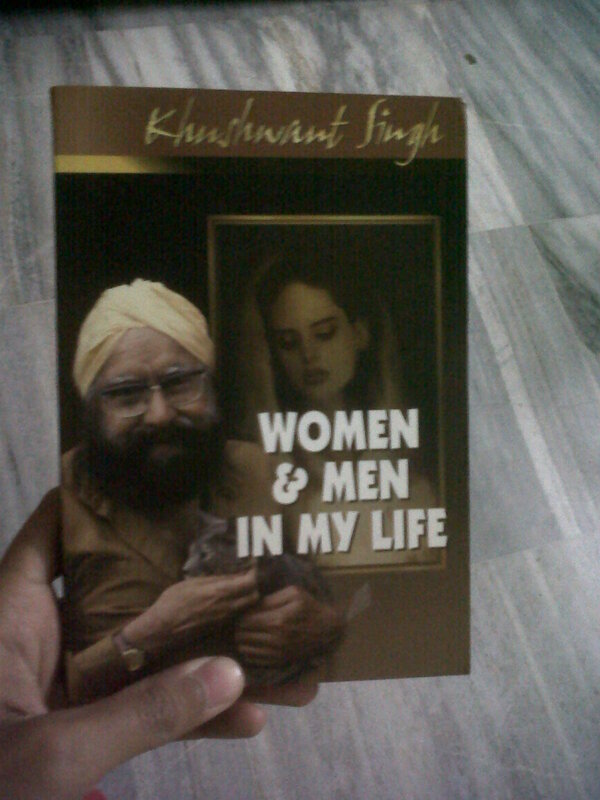 Khushwant Singh’s memoir Women and Men in My Life is divided into two parts, women he knew or wanted to know (I have a good reason for saying that) in the first part and men he knew in the second part. Twelve women and eight men, in fact.These are sort of character sketches not critical portraits but nevertheless sharp, witty and provocative reading material. If you like to gossip behind people’s backs that is. He loved women with beauty and personality and was bowled over by women who had both. He was drawn to different women, like moth to flame to seek out their stories. He wanted to be captivated and captivate them, spend time with them to understand where they came from, how it shaped their personality and made them who they are. Women he wrote about varied from Amrita Shergill (the only name I was familiar with) to the beggar maid who he didn’t know, to people who formed a part of his social circle. The men he wrote about, in far less detail I might add, included Chetan Anand and Inder Sain Johar among others. Khushwant Singh appeared to be an incorrigible gossip, taking great pleasure in exposing others and loved a scandal. What I liked about him ,was that he was a great sport when the joke was on him and thought nothing of saying what he felt, even if it was downright offensive. He lived life on his own terms and was completely unapologetic about his choices. But how his wife and family put up with it, is what I would like to know. Sometimes it is hard to believe that it is about real people he’s met during his lifetime. Too saucy for it to be believable and sarcastic to the point of being caustic. While reading this book the omnipresent question in my head manifested even more strongly- how much liberty can a writer take? And how many friends walked out of his life in a huff or threatened to kill him, after the book got released?I can never do what he did, writing an expose on people he knew personally and some he called friends. I read the book in between hospital visits so I can’t be a fair judge of the writing but addictive it definitely was. When I was in the hospital. It promptly lost its charm when I came home. Only to be picked up again when I needed to be distracted. This is a book from my grandpa’s library but thank goodness he hasn’t read it. He got it as a gift with a magazine subscription. I recently found out that nine sketches were missing from the book when I saw a much fatter book sitting on a shelf in a book store. Honestly you can never trust the freebies that come with a subscription. Nonfiction which reads like fiction, blurring boundaries. A book which can teach you how to draw different characters while keeping you entertained, with many cringe worthy and is he for real moments, is how I will remember the book.